North Korea has responded harshly, albeit late, to a comment tweeted by President Donald Trump early this year by threatening the Republican leader's hometown of New York City. North Korea's state-run Rodong Sinmun newspaper ran an article last week referencing a Twitter remark made weeks before Trump took office in January. At the time, Trump said North Korea's plan to develop a nuclear-capable intercontinental ballistic missile (ICBM) capable of reaching the U.S. "won't happen." Since then, Trump has deployed extensive naval firepower to the region to try to prevent North Korea from pursuing a sixth nuclear weapons test, sparking a recent period of heightened tensions in the Asia-Pacific. "Trump blustered early this year that the DPRK’s final access to a nuclear weapon that can reach the U.S. mainland will never happen," the article read, according to Foreign Policy, using an acronym for the country's official name: the Democratic People's Republic of Korea. 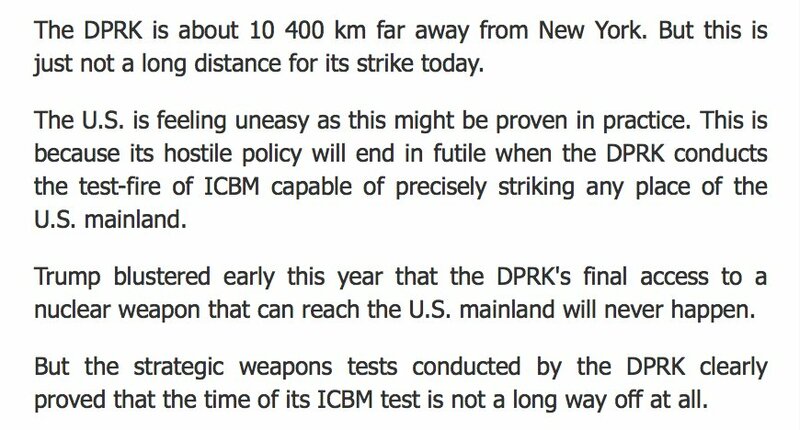 "But the strategic weapons tests conducted by the DPRK clearly proved that the time of its ICBM test is not a long way off at all." "The DPRK is about 10,400 km (6,462.26 miles) far away from New York. But this is just not a long distance for its strike today," the paper added. This is really some remarkable trolling of Trump by North Korea. Trump's tweet was a reference to North Korean leader Kim Jong Un's announcement earlier this year that the country was in the final stages of developing an ICBM capable of carrying a nuclear warhead. North Korea has never tested such a weapon and experts, such as Michael Elleman of the International Institute for Strategic Studies, don't believe the nation will be capable of launching such a weapon until at least 2020 or even later, and not before at least 20 flight tests. North Korea is still caught up testing intermediate-range ballistic missiles (IRBM) and continues to face significant difficulty, meaning that a jump to ICBM would likely only raise the rate of failure seen in recent tests. "There are no shortcuts to developing a reliable ICBM," Elleman, who is also a frequent contributor to North Korea monitoring project 38 North, told Newsweek. "While testing could start this year, it is unlikely that North Korea would have an operationally viable ICBM before 2021, and this assumes the regime is willing to accept a weapon that works only most of the time, not with less than 90 percent reliability." New York City, home to over 8 million people, is an unlikely target for Pyongang in part because it is so far from North Korea compared with other major cities on the West Coast, such as Los Angeles, which former members of Kim's government have threatened before. North Korea has also utilized its media to depict fictionalized attacks on the U.S. capital of Washington, where Trump now resides with his family. Multiple videos have shown simulated North Korean missiles "bombing" the White House, the U.S. Capitol and more. While the current North Korean ICBM threat to Washington is currently about as remote as that of New York City, the reclusive, militarized state's ballistic and nuclear arsenal, estimated to contain up to 20 warheads, poses a very real threat to U.S. military assets and personnel stationed in the area, as well as the military and civilian populations of nearby countries. North Korea maintains that its pursuit of nuclear weapons is solely a means of defending itself from foreign powers such as the U.S. While North Korea blames the U.S. for instigating the current crisis by dispatching two naval carrier strike groups among other military formations to the Western Pacific, it has also routinely warned that it would not hesitate to unleash its nuclear arsenal should the U.S. engage in military action. The result of such a conflict would likely be disastrous and fatalities have been projected to potentially reach as high as 1,000,000 dead. Trump has turned to China, North Korea's greatest ally and a frequent target of his own political agenda, to assist in halting its neighbor's nuclear weapons program. Beijing strongly opposes U.S. military presence in the region, but has also become increasingly frustrated with Pyongyang's nuclear ambitions and has voted in favor of U.S.-led economic sanctions. The issue has led to a rift in relations between the traditionally friendly socialist countries, but China has responded to the U.S.'s recent military moves, including major drills in the region, by pleading for peace from all parties. The 43-year-old, who is an honorary special delegate for the DRPK’s Committee for Cultural Relations with Foreign Countries, added: ‘If it is touched the people will defend it with guns and missiles. We have the thermonuclear bomb. Cao de Benós is the first westerner to be granted North Korean citizenship and spends his time between Pyongyang and his Spanish hometown of Tarrogona. He also described the secretive communist state as a utopia, saying: ‘The people have a basic, secure life with dignity. His message is one of three delivered yesterday, which echoed the message delivered by a top official at the massive ‘Day of the Sun’ military parade in Pyongyang earlier this month. North Korea has reportedly resumed work at its nuclear test site in Punggye-ri, according to the New York Times. In photos taken on Wednesday, analysts noted that the country appears to be preparing for its sixth nuclear test.